The flood of statements and tweets also flowed from the four members of Maine's congressional delegation. However, mass shooting survivors are asking for a lot more than thoughts and prayers from state and federal lawmakers. Each tweet from Maine's members of Congress contained a variant of the word "horrific" in response to a shooting that reportedly killed 17 people and injured 15 others, after the gunman moved through the Florida school reportedly firing an AR-15 semiautomatic rifle. Independent Sen. Angus King tweeted that such tragedies should not become normal. Horrified and heartbroken by today’s shooting in Florida. Another community robbed of lives and its sense of security – as we mourn with them, we must remember that this is not, and cannot become normal. But normalization of mass shootings is already happening, according to the survivors of the 10th deadliest school shooting in U.S. history. “They knew what to do, we knew what to do. Even still, even with that, we still have 17 casualties, 17 people who aren't going to return to their families. And to me that's totally unacceptable," said Melissa Falkowski, a teacher at Marjory Stoneman Douglas High School, who hid in a closet with 19 other students during the shooting. It's what she and other faculty had been trained to do in drills, drills that have become common in schools across the country. Falkowski says those drills are not enough. “From my personal viewpoint it's time for Congress, government, somebody to do something, and it's time to talk about what the problem is and try to fix it," she said. “My message to lawmakers in congress is, please, take action. Ideas are great. Ideas are wonderful and they help you get elected and everything," said David Hogg, a senior at the high school. Hogg was in an AP environmental science class when the shooting started. Now, he's a school shooting survivor, an unwilling bystander to the 41st mass shooting this year. Mass shootings have already claimed 82 lives this year and 590 last year. “What we really need is action. Because we can say it, yes, we're going to do all these things – thoughts and prayers. What we need more than that is action. Please, this is the 18th one this year. That's unacceptable. We're children. You guys, like, are the adults," Hogg said. Maine Public Radio asked each member of the congressional delegation to respond to the calls for action. None was available for an interview. But Democratic U.S. Rep Chellie Pingree forwarded bills she has sponsored, including ones that expand background checks and close loopholes. Learning of the tragic events unfolding at a Florida high school and keeping all of the students, teachers, and their families in our thoughts. We, in Congress, must do better to prevent these horrific tragedies that happen too often. A spokesman said Sen. King has supported fixes to the background check system and reducing the lethality of semiautomatic rifles by eliminating so-called bump stocks that allow the weapons to fire at similar rate to machine guns, as well as limiting the size magazines. “Senator King remains committed to pursuing each of these solutions to minimize their frequency, and is ready and willing to work with any of his colleagues to advance them through the Senate,” the spokesman said. Republican Sen. Susan Collins outlined proposals that she supports during a press conference in Washington. Among these proposals include measures strengthening background checks, alerting the FBI when someone on the no-fly list tries to buy a gun and eliminating straw purchases that can put guns in the hands of people who can't clear current background checks. Horrified by the news of the school shooting in Florida. 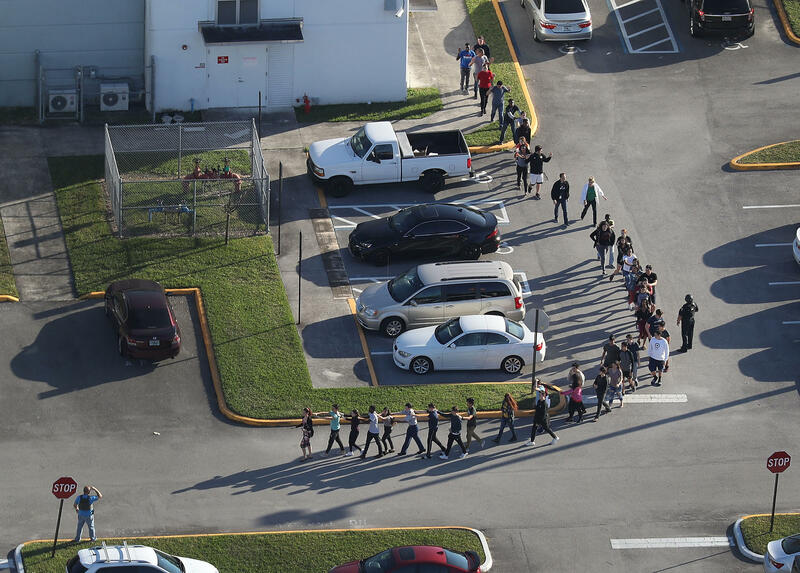 Grateful for first responders' action to protect & help students, school employees, & all those in the community. “Those are three very practical steps that we can and should take and that are overdue,” Collins said. The news from Florida today is horrific. My heart is with everyone involved in this tragedy. We are all grateful for the men and women in law enforcement and other first-responders for their heroism today. Poliquin also echoed President Trump's focus on mental illness. Last year, President Trump repealed an Obama-era rule that required the Social Security Administration to identify certain mentally disabled beneficiaries to a federal agency that conducts background checks. But he highlighted mental illness as a key component in mass shootings. “We are committed to working with state and local leaders to help secure our schools and tackle the difficult issue of mental illness,” Trump said Thursday. The National Rifle Association has led the effort to defeat bills that would restrict access to guns. It spent nearly $11.5 million to help elect Trump in 2016 and over $200,000 in Poliquin's reelection race. While there's a robust debate over whether gun restrictions would have any effect on mass shootings, such proposals are often a third rail for Republicans and Democrats. Shortly before airtime, only two of the nearly two dozen candidates running for governor had released an unsolicited statement on the Florida shootings. One of them is a former sheriff, state Sen. Mark Dion. Dion sponsored a bill four years ago that would have tightened rules around the unauthorized sale and transfer of firearms. Gov. LePage opposed it, and the Democratic controlled Legislature sustained the governor's veto. Dion said it's time to revisit the issue. He said thoughts and prayers are, "not enough and never will be."